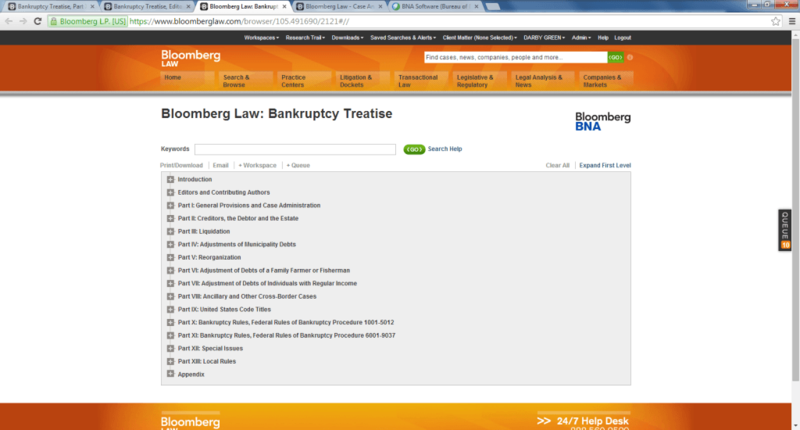 The table of contents for the new Bloomberg Law Bankruptcy Treatise. Think “bankruptcy treatise” and the first name that comes to mind is probably either Collier on Bankruptcy from LexisNexis or Norton Bankruptcy Law and Practice from Thomson Reuters. 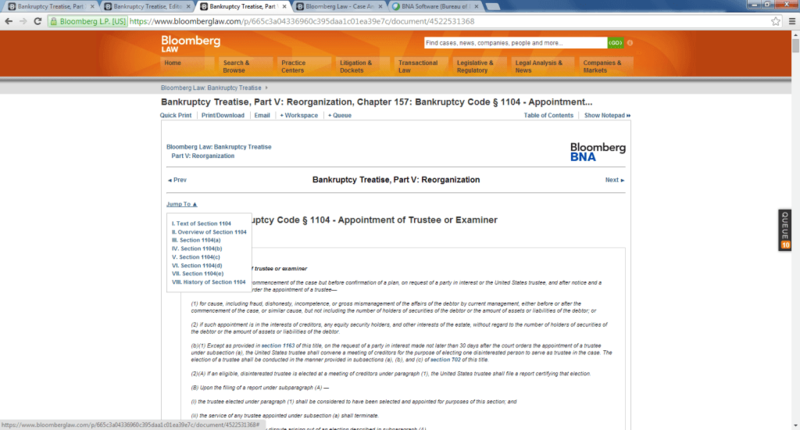 Now you can add to the list Bloomberg Law: Bankruptcy Treatise, launched today by Bloomberg BNA as an online-only resource. Besides the ambitious scope of its content, the key distinguishing feature is that it will be updated in real time, as new developments occur. Call it the pocket-part killer. An example of a code-based chapter. As an editorial project, it sounds to have been an ambitious undertaking. Over the last few years, Bloomberg BNA assembled an editorial board of more than 60 prominent bankruptcy judges, law professors and practitioners. They created 600 chapters containing more than 13,000 pages. The treatise includes commentary and analysis for all 92 different local Bankruptcy Court rule sets throughout the country. Going forward, Bloomberg BNA editors, with input from outside contributors, will update the material in real time as bankruptcy rules change and courts apply and react to them. I asked Darby J. Green, the lawyer who spearheaded this project at Bloomberg BNA, what “real time” means. “As soon as practicable,” she said. By contrast, Colliers is updated only quarterly, Green said. A drop-down menu lets you jump to different sections. Green noted that the latest amendments to the Federal Rules of Bankruptcy Procedure, which went into effect on Dec. 1, appeared in the treatise, with annotations, that same day. Several editors worked over Thanksgiving weekend to get that done, she added. 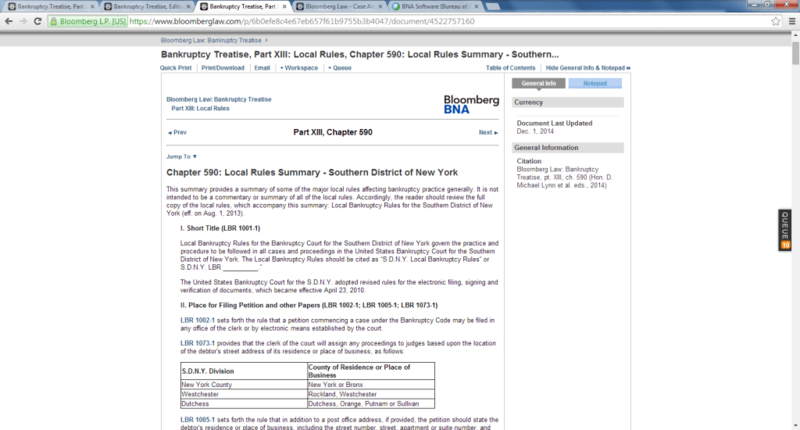 The treatise is available only on the Bloomberg Law legal research platform. The treatise can be navigated through its table of contents or searched by keywords. Searches can be restricted to specific subsections or chapters. Search results are listed in the order in which they appear in the treatise. Various filters allow further narrowing of search results. The editor-in-chief of the treatise is D. Michael Lynn, a U.S. bankruptcy judge for the Northern District of Texas. Other editors include Jeremy Coffey, Brown Rudnick LLP; U.S. Bankruptcy Judge Jeffery P. Hopkins, chief judge of the Southern District of Ohio; U.S. Bankruptcy Judge Stephen L. Johnson, Northern District of California; and Thomas E. Lauria, White & Case. Also serving as editors are Lorraine McGowen, Orrick, Herrington & Sutcliffe; U.S. Bankruptcy Judge Cecelia Morris, chief judge of the Southern District of New York; U.S. Bankruptcy Judge John K. Olson, Southern District of Florida; Prof. Nancy Rapoport, University of Nevada, William S. Boyd School of Law; Prof. David A. Skeel, University of Pennsylvania Law School; Prof. Charles J. Tabb, University of Illinois; and Stephen Youngman, Weil, Gotshal & Manges. Continue below for additional screenshots. Text is hyperlinked to primary code sections and case law. A sample chapter for a local court rule. 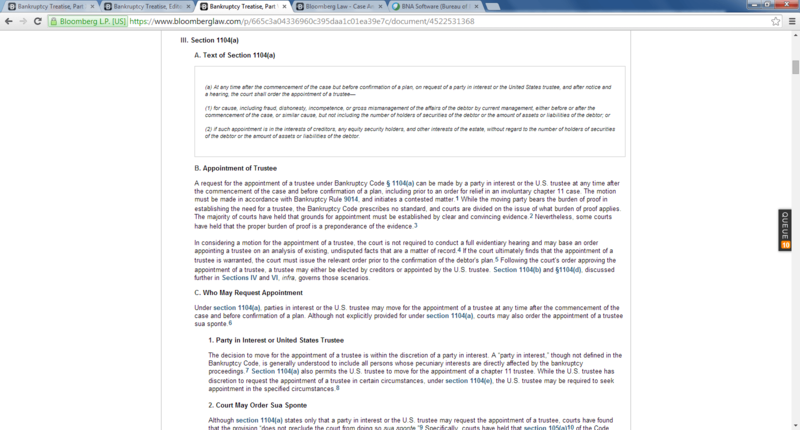 Note the right panel showing when the document was last updated and the proper citation.